We're home. Our southwest adventure was amazing: four states, four national parks, three time zones (who knew there is no daylight savings time in AZ? ), countless scenic wonders and attractions, a visit with family, and memories to last a lifetime! We were so busy (and tired by the end of the day) that I didn't read at all on the trip - not even an audiobook at bedtime. I eased back into books this weekend by reading a graphic memoir and completing a book I've been working away at for a few weeks. I love our fall sunsets in central New York, but temperatures are trending downward and many of the leaves are already gone. Snow is in the forecast... definitely time to think about heading south. A middle-aged couple takes a two year break from their jobs to visit every National Park. They write a book, comprised of emails sent to their friends Bob and Sue, chronicling the journey. I started this in anticipation of our trip, but found it worked better for me reading only a few emails at a time. It was just okay overall... I'll post a book brief soon. At last. My library finally purchased a copy of this foodie-themed graphic memoir. It's been on my wish list for years! Knisley's artwork is the star of the book, but her love of food shines though. It's probably more accurate to describe this as a coming-of-age memoir where life's pivotal events intertwine with food... and recipes are included. I've enjoyed a couple of Knisley's other books (French Milk, An Age of License: A Travelogue) over the years and plan to search out her remaining work when it's time for my next graphic memoir fix. 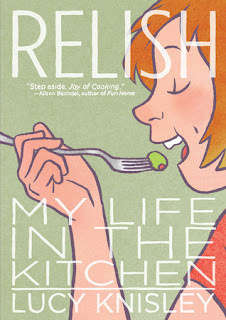 If you're unfamiliar with her work, Relish would be a good introduction. It's truly a delight. 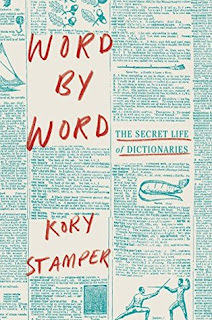 It takes a certain kind of nerd to appreciate a book about dictionaries... and I suspect if you're reading this blog, you might be inclined in that direction. I borrowed both the ebook and audio versions from my library - no waiting list for either ;- ) At the 30% mark, I've pretty much abandoned print in favor of the audio version. It's read by the author and is outstanding! So, our Gothic Gala was a bust. 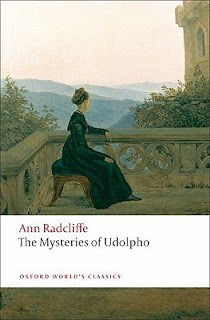 Three out of four of us abandoned The Mysteries of Udolpho. Are you still reading, Monica? I can only describe it as a slog in print and downright painful on audio. My impending trip probably didn't help... perhaps I might have been a little more determined (patient?) in other circumstances. I'm not ruling out another try at some point, but am in no hurry right now. 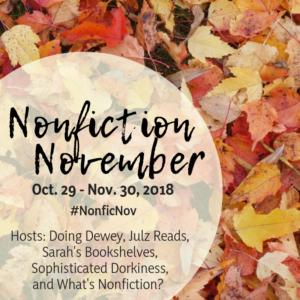 Nonfiction November is back! It has become my favorite blogging event of the year... details are here. You take such amazing photos! I'm off to look for Relish, and will give Word for Word another try in audio. :) I'm happy about Angus! Thanks, Audrey. The first chapter or two of Word by Word is a little dry (even on audio) but after that it picks up. The author is a great narrator... not sure I could read this in print. I know exactly how it is to travel and not have any time or energy to read! I've finally set aside the Dear Bob and Sue book and will use it as a reference for future trips, but reading it from cover-to-cover is unappealing at this point. I do wish the book had an index!! So, instead of reading, I've been catching up on my favorite rv vloggers, *Less Junk, More Journey*. I know you aren't traveling via rv, but I'll bet you would love to follow their travels. They were just in Alaska, which is high on our list of place to go in the next two years! We've arrived in San Diego where it is much cooler than AZ, NM and TX! Hard to believe we will be home in 2 weeks. Can't wait for Nonfiction November! Love that challenge! We're curious about rv travel and may even go to a show when we're in FL. Renting one might be the best way to get around Montana and to Glacier NP... hotels are few and far between up there, I'll bet. We saw lots of rented RVs in Utah. Watched one of Less Junk, More Journey's introductory videos - intriguing! Love San Diego, but haven't been there in over 20 years. It was chilly in northern AZ an NM when we were there... temps were 100 in Las Vegas, then done the the 40s by the end of our trip. Made packing more difficult, lol. I agree about the tone of the letters (in Dear Bob and Sue). I felt that the couple took too many digs at each other in order to sound funny. Instead, they came across a little mean-spirited. Ooooh, how exciting that you two are considering rv travel. Yep, we have seen a lot of rented rvs on our trip and it's probably a good way to see if you enjoy the lifestyle or mode of travel. It certainly makes packing easier, too. I have room for both cold and warm weather clothes. The early videos of LJ,MJ are fun, but their style & vlogging has really evolved over the years. Check out some of the more recent ones of their time in Alaska. The drone footage is spectacular! San Diego has changed a lot since we lived here (1972-1992). It's beautiful and you can't beat the climate, but two days of driving on the freeways (in my brother's car, not the rv) is enough to keep me from longing to move back. There are so many crazy drivers and so many cars on the freeways!! Eeeek!! I'll check out those later videos - thanks. Not sure if an rv trip is for us, but we're definitely curious now! First of all, I knew that AZ didn't have 'Daylight Saving Time'. However, I bet a lot of people don't. When we visit there, we have to remember is DST in effect or isn't it? Sometimes, we have a 2-hour time change and sometimes just 1-hour. Happily, my watch and phone change themselves these days. I've loved the Lucy Knisley books I've read. Have not read this one, but I've read An Age of License and also Displacement (loved that one especially). I keep meaning to pick up Something New at the library - it's about her wedding. And I see that she will have another in February entitled Kid Gloves - think she's had a baby. Kay - It seems so strange that AZ doesn't do daylight savings time. Last year in FL, there was talk about the state staying on daylight savings time all year long, lol. Texas sure has some crazy weather! Things are finally starting to cool down in SWFL... at least no 90s on the island this week. Fall has yet to arrive there, I'm afraid. Your pictures are always so lovely! I'm looking forward to Nonfiction November, too. Welcome back! Word by Word looks good. Enjoy...and have a great week. Thanks for visiting my blog. I might have to try Nonfiction November, as I've been buying a few memoirs. I guess those count, too, right? Laurel-Rain Snow - As much as I love traveling, it's always good to get back home and settle into a familiar routine. Nonfiction November is the perfect time to tackle all those memoirs! They have a topic post you can join in each week and a collection post for reviews. Hope you decide to participate. I get so many new suggestions each year and have met many new bloggers. Glad you enjoyed your trip. And, wow, what a shot! I'm really looking forward to nonfiction November too. I've slacked off on my nonfiction reading. Iliana - I haven't read quite as much nonfiction this year either, but that event helps me get back on track. I cannot imagine doing Udolpho as an audio—this is a book that requires parts to be skimmed. It also requires the right time. Sorry it was a bust—when I read it, it was a lark...but time and place were definitely a factor. Glad you enjoyed your western jaunt. I love National Parks and the west, and so glad you got to enjoy them. I thought about reading Dear Bob and Sue, but some Amazon reviews put me off it. JaneGS - This was definitely not the right time for Udolpho! Should have known better than to try something like that immediately before and then during a trip. Think I could have pressed on under different circumstances... just being at home would have helped. May give it another try if the opportunity arises. National Parks are the best! 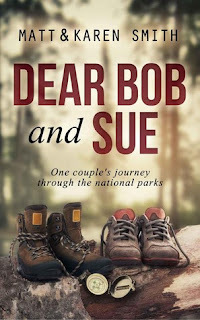 Dear Bob and Sue is free on kindle if you have amazon prime and I enjoyed reading their experiences in the parks we were visiting. Overall I didn't care for their tone. Hope to get a review up Thursday. Yay! Glad you're planning to join in Nonfiction November! Sarah - Wouldn't miss it!! Kym - My daughter is reading Word by Word now, too, and she loves it. I loved Relish, and Word by Word is on my gigantic list. Glad your trip was great. When I lived in AZ, I always thought it odd that they didn't go on Daylight Savings Time. Beth F - I only found out about AZ time when plugging our destination into google maps... "your destination is in a different time zone." Though I'd made a mistake! You have been traveling so much! Those books look unique and quite foreign to me. I remember when we took road trips...one bag would just be filled with books. Now all I need is my Kindle. What fun to babysit a sweet dog! Patty - We have been on the road a lot lately! In another week or so we are planning to drive one of cars down to FL, get the place set up for the winter, then fly back here before Thanksgiving. My kindle is a lifesaver with all of this traveling! Oddly enough, I think I'd love Word by Word! Word for Word does sound good. I am that kind of nerd. Your trip sounds like fun too. I did know that Arizona doesn't do Daylight Savings but have always wondered why. Come see my week here. Happy reading! Kathy - That seems so strange about AZ not doing Daylight Savings. Last winter in FL, there was talk of staying on Daylight Savings time all year long! I envy your traveling. We've been traveling locally but we can't go far because of our Master Naturalist commitments. 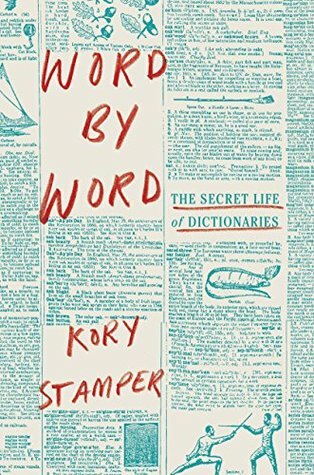 I loved Word by Word and Relish, and I'm waiting to see what you think about the book about the national park visitors. Deb - We're very fortunate to have so much flexibility to travel now... we're going to take advantage of it while we can! Hope to get my review of Dear Bob and Sue up on Thursday or Friday. 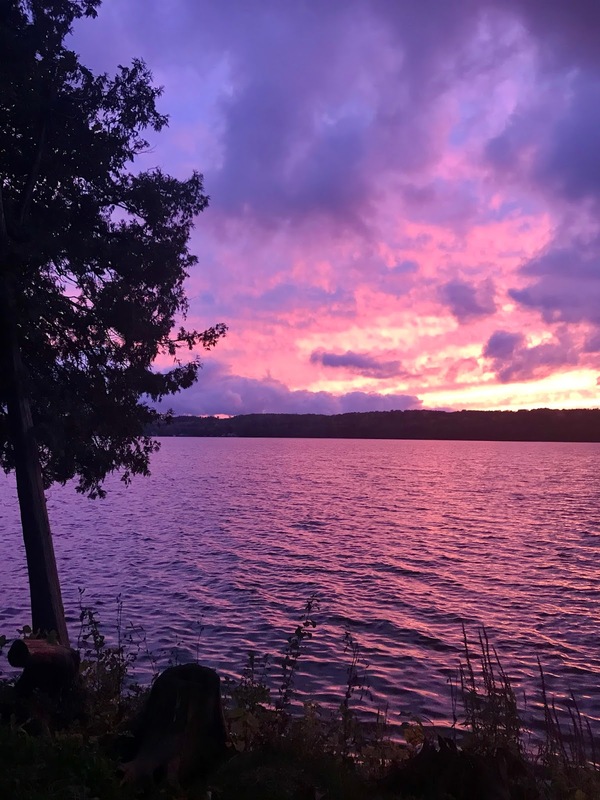 Sounds like you made some great memories and that sunset! Wow. Ti - It really was an incredible trip... I'm in awe of the beauty found in out National Parks! pussreboots - Happy to hear about Knisley's new book. She is so talented! I knew that about Arizona! Probably because I live near it. I’m glad you had a good trip! I liked seeing all your photos on Instagram. Have a great week. AJ - Most people in that part of the country would probably know about the AZ time zone thing, but I was shocked. Actually thought google made a mistake when they said "your destination is in a different time zone." LOL! JoAnn, I am really pleased you enjoyed your southwest adventure so much, even if your reading suffered a little. Over the last week, I finished reading the historical mystery Kin by Snorri Kristjansson for the R.I.P reading event. I also enjoyed an amazing trip to the Harry Potter studio tour :-D Happy reading this week! Jessica - Sounds like wonderful RIP activities to you! Last night I finally got started on some fall-themed reading... Nine Coaches Waiting by Mary Stewart. Hope you have a good weekend! Glad your trip went well and Angus is back, that's great! Thx for mentioning Word by Word; that one interests me. I was once a copyeditor so every little word & detail on the page sort of gets me. I will look for the audio version at my library. It reminds me of the book Between You & Me by Mary Norris - which you might also like if you have not read.